Chocolate Walnut Dollars and delish! 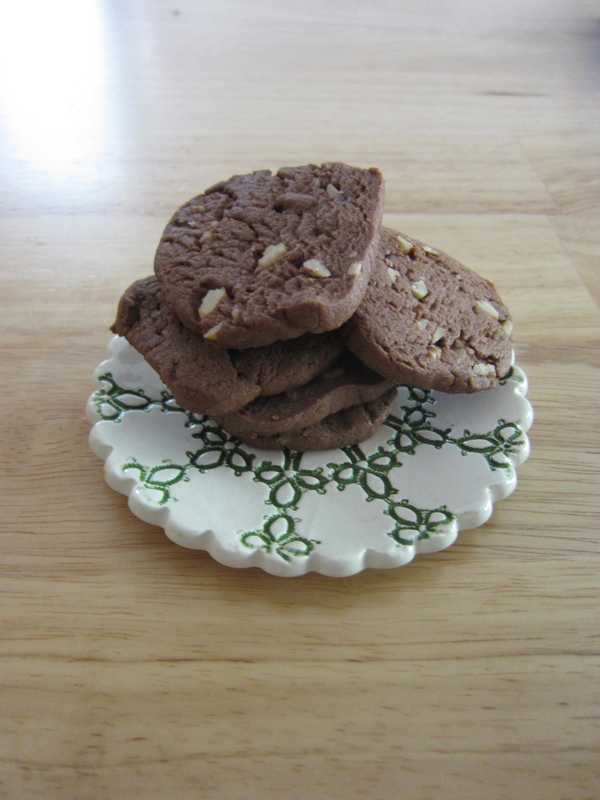 The recipe I posted today was just too tempting, and since I have some time on my hands lately, I decided to try out the Chocolate Walnut Dollars. Okay, here we go! First I creamed the shortening and sugar, then added the egg and finally the rest of the ingredients. Before I added the nuts I made sure they were finely chopped, considering how thin the slices would need to be. I could have chopped them even finer, honestly. This is a very dry recipe. With the recipe as written, it was just crumbs, so I added between 2-3 tablespoons more milk. If you make this yourself, I suggest starting with the 2 tablespoons called for and increasing by 1 until the consistency is moist enough to bind but not mushy at all. Next I rolled the dough in waxed paper and refrigerated it for 40 minutes. It probably could have gone to 60 minutes. I noticed that the more firm the center of the dough was, the easier it was to make clean slices. I used a sharp knife but you could get an even cleaner cut with one of those wire cheese cutters I bet. The nuts did get in the way of a clean cut and the dough did mush down as it warmed to room temperature. Each slice stayed exactly as it was while it baked. They don’t melt like some cookies do, so you could get maybe 15 per sheet instead of 12. Since the recipe didn’t have a temp or time, I went with 350 and started checking at 5 minutes. After 7 minutes they were firm and I didn’t want them to cook too long, so out they came. As I said, they looked exactly the same as when I sliced them. 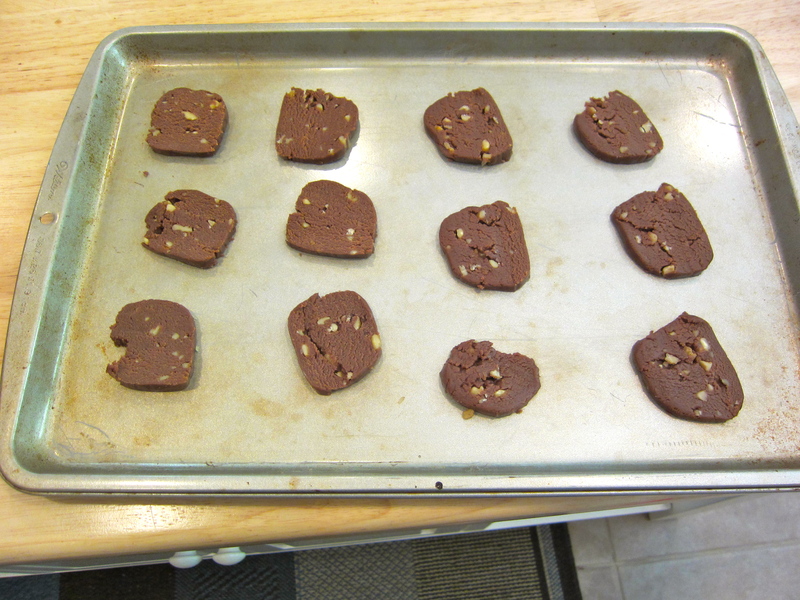 The finished cookie is not sweet, but also not an overpowering chocolate taste either, which is my preference. They are firm but not hard. You could liken them to a shortbread cookie, sort of. If you really wanted to go all out, these would be great dipped in chocolate. I enjoyed them with a glass of milk. The yield is over 50 cookies, depending on how thin you slice and how small you roll the dough log. 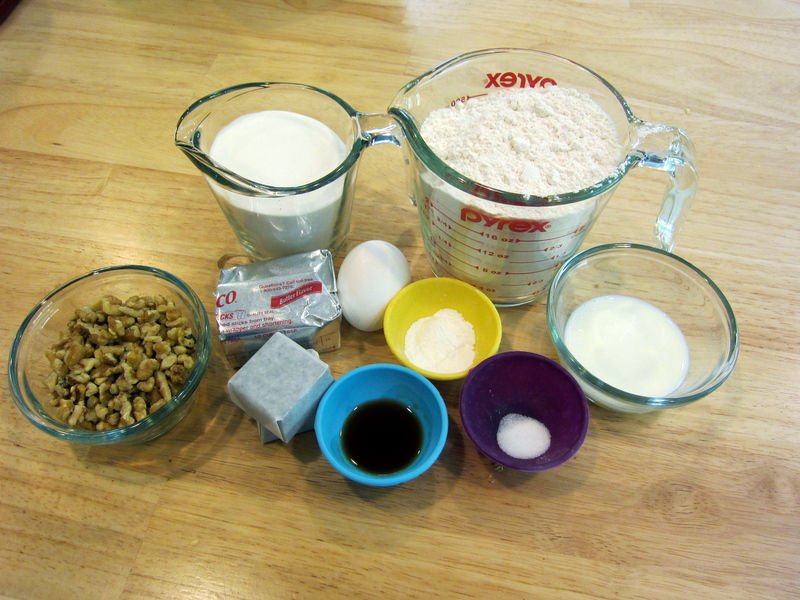 In the picture for the Chocolate Walnut Dollars ingredients, the flour and sugar are pictured in liquid measuring cups. I hope you used dry ingredient measuring cups to measure both the sugar and flour instead of the liquid measuring cups. The measurements are not the same for the two different cups. I hope you have the flour and sugar displayed in the liquid measuring cups because they are made of glass and therefore easier to see the ingredients. Thanks for your comment. The measurement of a dry cup to a liquid cup is the same. The difference between the two types of measuring cups has more to do with how they are used. Liquid measures are not designed to be filled to the top so that fluids will not slosh over the edge. Dry measures are designed to be filled to the rim. You can test this by pouring a cup of water in a liquid measuring cup and then pouring into a dry measuring cup. The quantity is the same.